Hey everyone, it’s Whatever Wednesdays again, and today is going to be a post about “The Case for Christmas Lights”. The Case for Christmas Lights? So let me preface this post with the fact that I went to Walmart on Tuesday and spent about $200 on Christmas Lights. At first glance, you may be taken aback and think that Sensei went a little bit crazy this Christmas season and started making it rain at Walmart. The truth of the matter is that Christmas Lights are expensive. If you add on to the fact that powering them with electricity isn’t free, then it’s kind of a recipe for not great value. How did spending $200 in Christmas Lights get past his Value Cost Ratio? $200 is a lot of money to spend on anything, and especially on something that doesn’t seem to hold any intrinsic value. I mean, you can’t eat it, you can’t interact it with — in fact you have to take time out to put them up every year and put them away ever year. Some of my friends seemed very surprised that someone like me <ahem, who is frugal, and a big saver, not a big spender> would buy Christmas lights. I’ll explain more on that later. Please remember that I’ve already gone to the local hardware store and bought screws to hang under the eves of my house on Monday. So Tuesday was really just buying the right lights — and enough of them. So I had to get a rough estimate of how many feet of lights I would need. The rough estimate that my friend and I came up with on Monday was about 80-85 feet. However, you must also account for the “sag between hooks”, as well as the “extra length” you may need in order to plug it into an extension cord. I think you should make sure the extension cord is securely on the ground, not hanging in mid-air. So, the rough estimate was around 100 feet to be safe. The next decision is what kind of lights do you want. Originally, I just wanted big rainbow bulbs since that was what we had at my house growing up. However, my kids seem to really like the “combination” lights we have on our Christmas Tree. They glow white steady, then off and on, then rainbow colors steady, then off and on, etc. So my wife suggested that we get something like that. Then, I’ve always thought it would be nice to have icicle lights, since we don’t get snow on Oahu. So, the plan was 100 feet of combination lights and 100 feet of icicle lights. I’m not sure if these are exactly the items I bought, but the’re pretty similar. Now, if you did the math, you may see the prices online if you add them all up are probably less than the $200 I paid. I think some of these things cost a little more in Hawaii, or maybe they just started a sale or something. Just trust me that I paid ~$190 — and it hurt a bit. By the way, my wife loves this movie. Continuing on, I wanted to be safe and make sure to get an outdoor rated extension cord with 3 outlets. That way each string of lights would have its own outlet — and if needed I can add a 3rd string next year. I ran the extension cord from inside the garage to outside. Then because I wanted to make it easy for my family, I added the all-weather timer so that the lights would go on around 5:45pm and go off around 9:45pm. Since I work nights, I won’t be around to make sure it’s working and now they won’t have to worry about it. The 100 feet measurement was enough with a little bit at the end for a little flourish. Additionally, the guy at the hardware store recommended I wiretire some of the lights to the hooks since it can get windy in Hawaii and Christmas Lights have been known to blow off/away. So I took his advice and wired tired at each of the corners. These Christmas lights won’t be going anywhere. Hmm, you’ve put some thought into it… but it’s still so expensive! However, my kids will only be kids for so long. For this reason, my wife and I wanted to try our best to give them the magic of Christmas as much as possible. Before you know it, they will be angsty teenagers who won’t want to hang out with “old mom and dad” anymore for the Holidays. So, I want to make sure they have these good memories of a Christmas tree that they helped decorate and Christmas lights on the house. Just like my mom and dad provided a memory of a house with Christmas lights and a Christmas tree, I want to provide the same for my kids. More so than that, it is something I promised my daughter when she was a toddler. Even if she doesn’t remember it, I do. It’s $200, and that’s a lot of money. However, it’s not a yearly cost — it’s mostly just a sunk initial cost. What I mean by that is I hope (and expect to) get some good long lasting value out of this purchase. Since they’re all LEDs, I think that these lights will last 5-10 years if I take good care of them. Then all I need to do is take them out every year, hang them, and use them Thanksgiving through New Years, and take them down again. If they last 5 years, that’s $40/year, and if they last 10, that’s only $20/year. Of course, I am not considering the energy cost, but that is still relatively small considering they are all LEDs, especially compared to when I was a kid. Anyways, that’s how I am rationalizing spending what is probably perceived to be a lot of money. Well, how did it look? I don’t want to toot my own horn or anything, but I was actually surprised by how well it turned out. The icicles gave off a nice blue hue to the whole outside of the house, with the combination lights providing hints of color to light up the silhouette of the house. We are kind of lucky in that we are a little bit elevated. This makes it so there is nothing really behind us except a mountainside in the distance which doesn’t have any houses (or lights) on it. It provided a nice dark backdrop for our lights. Another thing is that I was impressed by just how bright these LED lights are. I guess technology has really advanced since I was a kid. Christmas Lights are expensive… but I think worth it, at least for me. LED lights are really bright, more than I expected. Be safe, and please use outdoor rated extension cords and such. 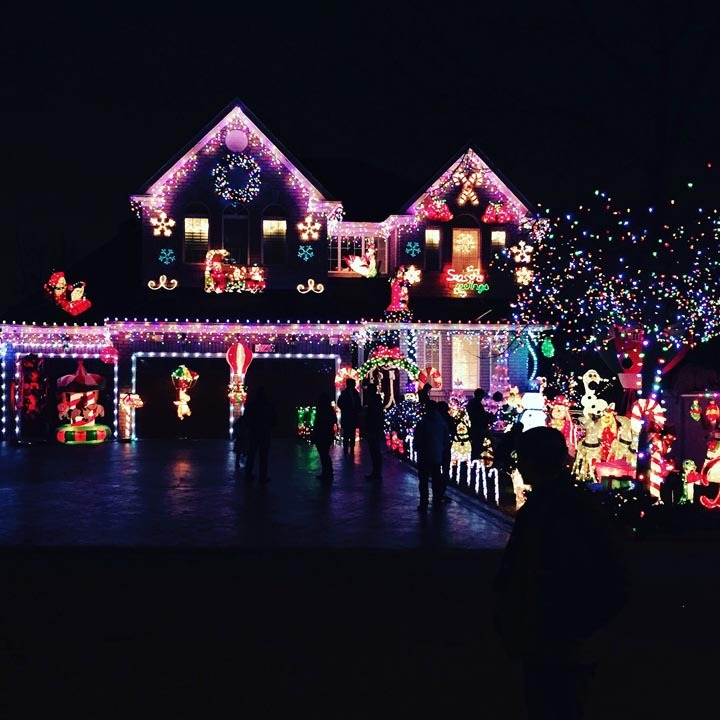 Sensei – I had a dilemma this year as I tried to decide if Christmas lights were worth it. I guess if you consider the 5-10 year life that you should be able to get our of the lights it isn’t all that expensive. I know nowadays you can have lights installed permanently on your home so that it truly is one initial sunk cost. Here’s a link to the lights I was considering: https://www.exterpro.com/all-occasion-lighting/ What do you think about that? Curious how that would look using your value cost ratio. Sorry for the slow response on this one. This is an interesting idea. I don’t have any experience with the idea of permanent lighting, so I can’t really comment on it. However, a concern I have is that these lights would be visible all year round (even if they aren’t on). Then, the other issue would be who maintains the lights if you experience problems with them since it’s somewhat specialized. The 3rd concern would be that if you ever decide to sell your house, the prospective buyer may not want to have permanent lights on the house which may make the house itself a harder sell. For me, I think doing a simple few rows of lights by making it easy to remove every year (by using hooks) is still my optimal solution. This may change next year if we add more lights though.